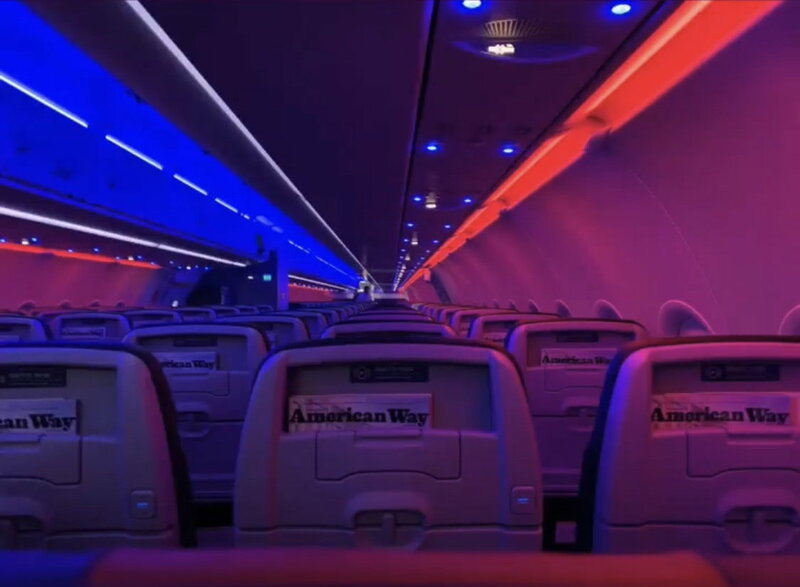 Courtesy of user itripreport, I present to you a snap of the interior of the AA A321-NEO. Looking at the colors, I want to be more like, "ladies and gentlemen, now on stage.....give it up for Stormy!!!" kellytoronto, scolbath and morrisunc like this. IADCAflyer, LAX_BillyJoe, platbrownguy and 1 others like this. Yup. 1st row of F greatly improved from 737 Oasis. The F class seat looks like the PE seat on the 777s and other widebodies. Same? Yes, the Rockwell Collins MiQ seat without foot rest or pegs (and the setback bar and lack of underseat storage, unless anything has changed). ...and without those pesky seat-back screens that only fools that fly DL seem to appreciate. CMK10, iadisgreat, jerryss and 5 others like this. gateH15, iadisgreat, TSparky and 3 others like this. So much to look forward to in that "Premium" cabin. Is the lighting supposed to hypnotize us so we don't observe the lack of knee room or AVOD? morrisunc, gateH15 and JDiver like this. I love how JFK-LAX/SFO Planes get to keep seat back AVOD but flights like MIA-SEA don’t have it. Clearly AA knows these are valued to keep them on their most high profile domestic routes....but the rest of domestic customers can just _____ it. Looks like those painful Oasis retrofit seats that I experienced on a 738. I won't be flying these aircraft. Laughing at AVOD...It’s 2019 buy an Ipad. I've never actually used the entertainment streaming service on AA. But if it means I can finish watching my movie/TV show without being interrupted for a 5-minute credit card pitch, that might actually be an upgrade from the seat-back screens. bscooter26 and 757FO like this.